Would you like to volunteer in the Library? Are you interested in becoming a library volunteer, but are not too sure about what it involves, or whether you have time? 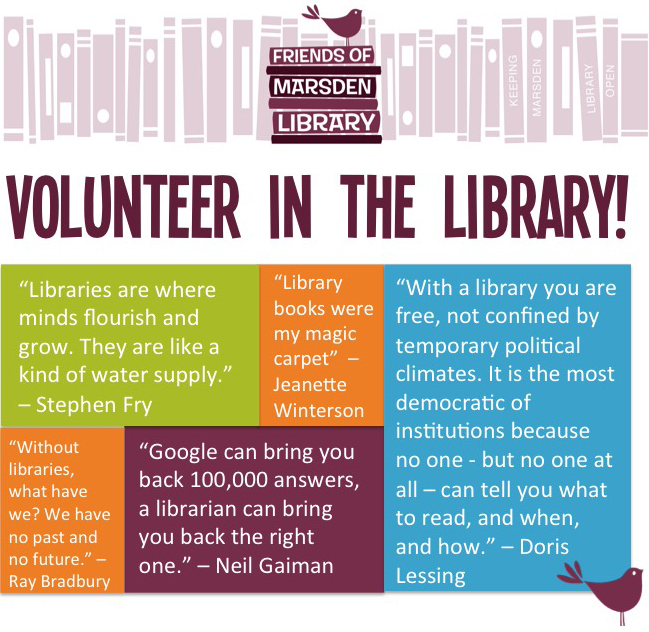 It’s really important that Marsden Library continues to attract volunteer support, so that we can keep up with the Library opening hours and offer interesting activities that meet the needs of our community. There are many different ways you can volunteer: from helping with enquiries, or shelving books, to sharing your hobbies and interests with others. Could you run a scrabble club perhaps? Or are you really into computers and coding – coding has been really popular in other libraries. If you have an idea, or just want to meet other volunteers and find out what they do, join us on 22 November, 2pm, Marsden Library for a Volunteer Celebration, where you can chat to Library staff and existing volunteers over a brew and a slice of cake. All Welcome.